In the 1970s and 80s, the most prestigious job that a recent university graduate could attain was one in public service. This was true of Dhaka, of Milan, or of New York City. The 'baby-boomers', as that generation is known, were generally looking for stable, well-paying jobs with a decent pension. And once a graduate attained such a job, they were likely to hold on to that job for the rest of their careers. In the 1990s and early 2000s, there was a gradual shift away from public service as university students looked for jobs in engineering, the physical sciences or economics. This was driven by the demands of the private sector in both the developed and the emerging economies. In the technology sector, as an example, companies such as Microsoft and IBM grew in size and scale. Jobs at these well-established companies were coveted by recent university graduates. 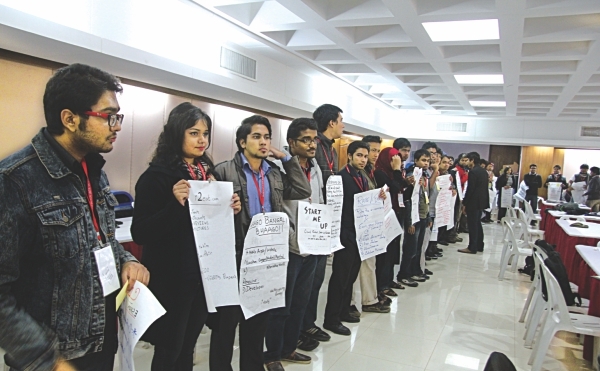 Creative minds come together on a common platform at the Startup Weekend Dhaka. Fast forward to 2012 – and we see an entirely new movement that is taking the world by storm – entrepreneurship. Young men and women across the globe are taking the leap of faith and choosing to pursue their own dreams. University students are forgoing jobs in either public service or large established companies in favour of launching their own ventures. In a recent Forbes article, the current business environment was compared to the weather - unpredictable, disruptive and exciting. Only five years earlier, Nokia, Motorola and Research in Motion occupied 64 percent of the smartphone market. Today, almost everyone - in an inconceivable scenario - is carrying an iPhone or Samsung. Entrepreneurs emerge as natural players in a chaotic environment as such, taking risks and challenging the traditional business cultures in pursuit of their dreams. Therefore, when the idea of a 54-hour time stamp to identify the next big startup occurred, there could only be one question in the air - was it even possible? Was it an idea so disruptive that it would either completely fail or change the way we pursue entrepreneurship forever? Thankfully, the latter was truer. The Startup Weekend (startupweekend.org) materialized into a 54-hour competition that brought together designers, developers and entrepreneurs in one room to pitch, design and develop their ideas. What was even more exciting was its ability to combine business with technology and leverage on emerging cultures to create the startup of tomorrow. After successfully taking place in 150 cities around the world, the Startup Weekend finally made its pitstop to Dhaka and gave aspiring young entrepreneurs an opportunity to learn through the act of creating. 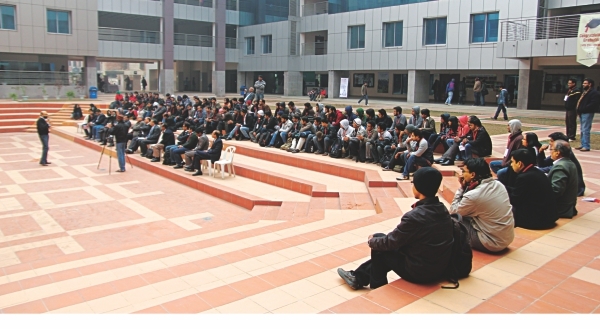 On the morning of January 10, 2013, the amphitheatre at Independent University Bangladesh (IUB) was buzzing with anticipation. The line extending from the Startup Weekend Dhaka (#SWDhaka) registration booth went outside the gates with young people - those of age and those at heart - excitedly chatting about their next big idea. These were the brightest of the lot, selected into top 100 from a swooping 600 plus applicants who registered for the competition. The opening ceremony compiled a diverse lineup of speakers, including Kamal Quadir (Keynote Speaker and CEO at bKash), Mr. Towhid Samad (Chief Guest and Chairman of the Board of Trustees at IUB), Dr Omar Rahman (Special Guest and Vice Chancellor at IUB) and Ejaj Ahmad (Founder at Bangladesh Youth Leadership Centre). After inspiring conversations on hurdles to success and stories of conflict and persistence, the participants headed straight to pitching ideas. The challenge, of course was to pitch it in sixty seconds - and it was a round of fire, blood, sweat and innovation. Developing an idea always involves a lot of brainstorming. Popular voting determined the top 21 ideas from over 50 pitches. As teams organically formed and grouped around tables to start the real deal, the Startup Weekend Dhaka team introduced coaches from diverse backgrounds to help with the creation of business models, technology based products and ideas on customer validation. The teams were prepped, and opened floor to the following two days that would determine whose idea stands, and whose model combines business effectively with technology. The rest of the story doesn't fit in column space. Coffees devoured, lunches forgotten and sheets of paper scribbled on - everyone was hooked and wired to their laptop screen, watching their dreams slowly turning to realities. Sessions began as early as half past eight in the morning and in spite of the biting cold wave, participants arrive, more energized and focused than the night before. It was no uncommon sight to hear the organizers pleading on the microphones, trying to get the participants to leave the venue, often as late as half past ten in the night. The enthusiasm was contagious, and competition evolved to collaborations as teams began reaching out to help others and share experiences over the weekend. The adjudication panel at the programme. 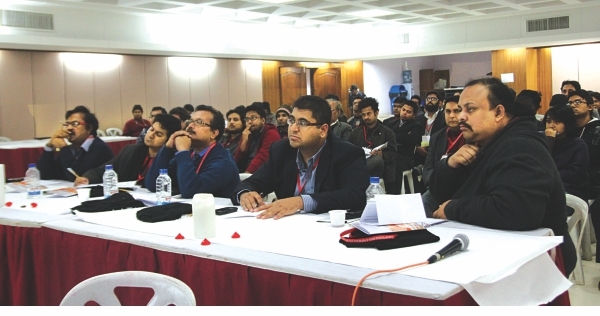 While participants toiled away into creation, daily sessions were 'interrupted' by talks from more experienced entrepreneurs and technology advocates. Through disruptions and chaos, participants listened to stories of entrepreneurship from Asif Saleh (Senior Director, BRAC) and Fayaz Taher (CEO, Fortuna Group), thinking it big from Iraj Islam (Co-founder, NewsCred) and Shammi Quddus (Head of Business Development, A K Khan WaterHealth Development) and potential of mobile markets from Nash Islam (CEO, Mangoes Mobile). Coaches like Sufi Faruq Ibn Abubakr (Founder, Projuktite Bangladesh), Samira Zuberi Himika (CEO, Team Engine), Razin Mustafiz (Product Manager, NewsCred), Shumon Jahan (CTO, Techmania) and Zubuyer Kaolin (CEO, Ogniroth Studios) delved deeper into the dynamics of developing mobile or web applications - and converting simple ideas into profitable businesses. On the eve of January 12, 2013, the Multipurpose Hall at IUB had suddenly transformed. As judges began arriving for the final round, participants were found in the basement with flashcards, practising their final pitches. All projects have been submitted and defeating headaches, sore throats and backpains, participants eagerly waited for their startups to be called on the podium for pitching. The judges, Kazi Monirul Kabir (Country Consultant, Google in Bangladesh), Tanveer Ali (Executive Director, Avarice Investments), Mridul Chowdhury (CEO, mPower), Dr. Ananya Raihan (Executive Director, DNet) and Pallab Mohaimen (Deputy Feature Editor, The Daily Prothom Alo) listened with equal anticipation and excitement, not forgetting the drilling Q&A that followed each pitch. The winning team (Bhago Bangali Bhago). The final round introduced startups ranged from online sales of art pieces, web-based doctor appointment system and portals connecting musicians through a virtual record label to systems helping mothers to find babysitters and twitter revisited to share cab or CNG space for commuting. They were explored and presented to an audience of participants, guests, investors, media and enthusiasts from different walks of life. In the end, after over 40 hours of nonstop action, the winners were finally announced. Bhago Bangali Bhago (BBB) scooped the first prize with a text messaging powered system that uses web and mobile outlets to mobilise young people away from unsafe locations and redirect them towards more happening activities in the city. Drawing from a wide range of references and information sources, the boys from BBB were able to come up with a convincing model that combined social needs with a revenue stream that truly deserved the honour of winning Dhaka's first Startup Weekend. In retrospect, the organisers and guests were thoroughly impressed by the quality and dedication that Dhaka's rising entrepreneurs demonstrated over the weekend. The fact that people were willingly helping each other out created a dynamism rarely seen in a competitive environment, and opened scope for further collaborations. What sets a Startup Weekend different from any other movement is its ability to mobilise people towards sustainable startups, and SWDhaka hopes to build into the same mechanisms that will convert ideas to real companies in near future. 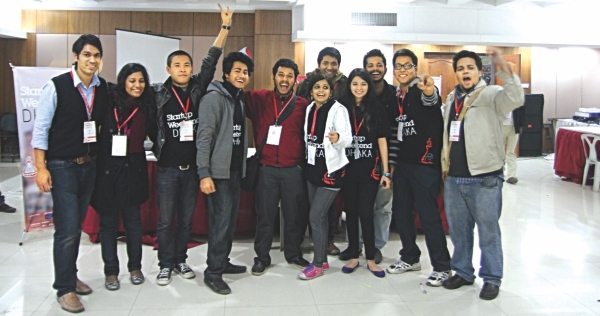 Organisers celebrate the success of the Startup Weekend Dhaka. The Startup Weekend Dhaka is immensely grateful to Google (galactic partner), Microsoft Bizspark (global partner), Independent University Bangladesh and the One Degree Initiative Foundation (premier partners), Qubee (internet partner), The Daily Star (media partner) and OSCom, Green and Red Technologies, NewsCred, Payza Bangladesh, Fortuna Group and BDJobs.com (sponsors).